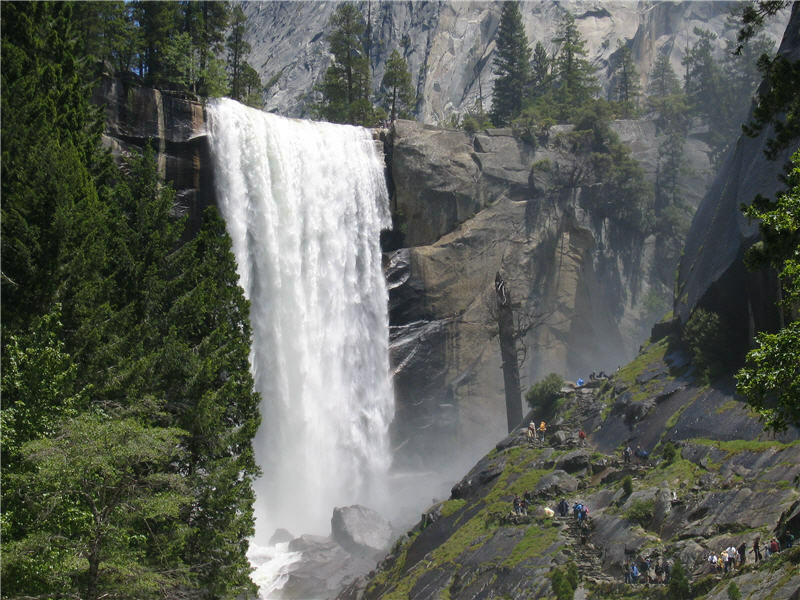 Today we plan to hike up to Nevada Falls. 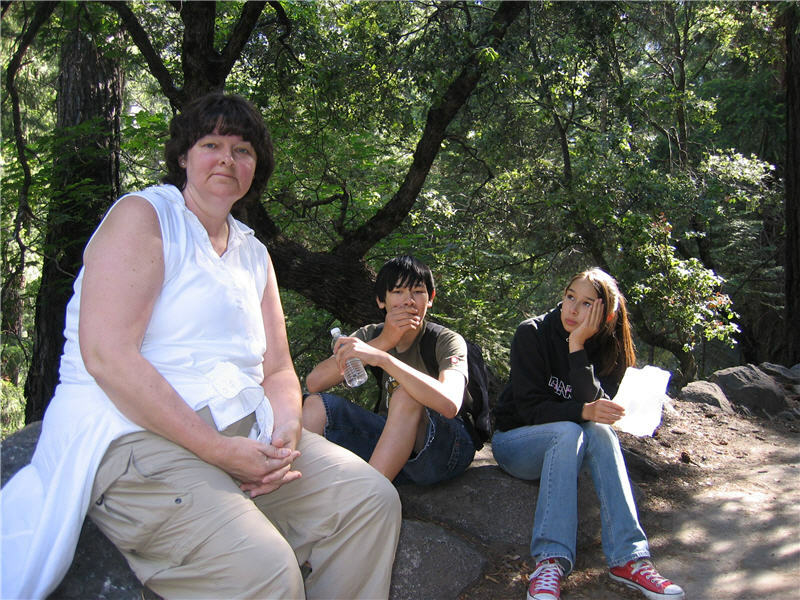 This is a special hike because we are all going together. I have been talking about the water falls and the blooms a lot. This was supposed to be a long weekend but somehow is now just a day trip. 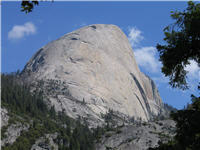 The date was set a long time ago as a Half Dome in a day hike. The cables have just been put up but the weather forecast is winter like. 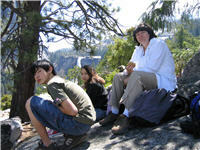 So it is just as well to postpone a Half Dome hike. We grab one of the last parking spaces in the Curry Village day use lot. The day starts out cold, but the trail warms us up nicely. The sun is out but we are in the shade mostly. My goal is to get some nice photos of Vernal, Nevada and wildflowers on the John Muir Trail. Check out the results below. Stuart hides form the camera. There are two flower types in this photo. 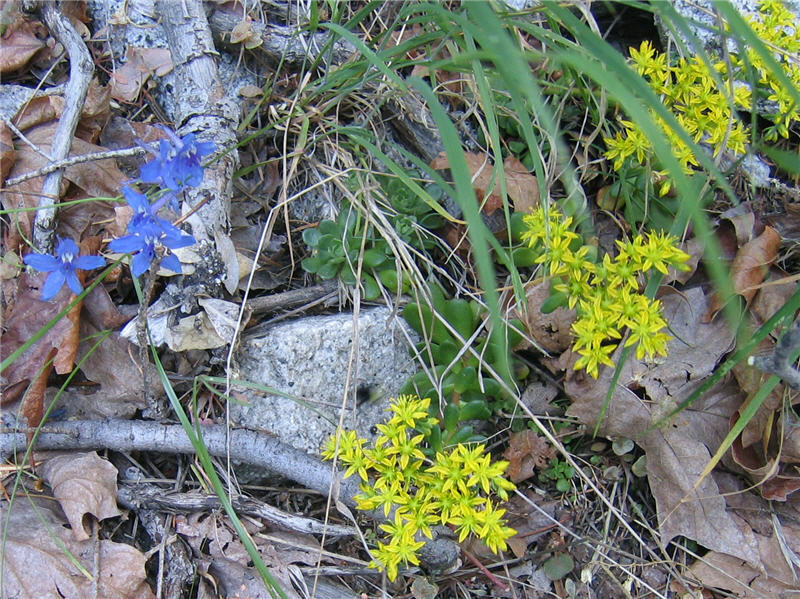 The yellow is Sedum spathulifolium, or common named Pacific Stonecrop. The blue flower was much harder to identify. The photo is not so good, but I guess that this is a Githopsis pulchella, Sierra Blue Cup. I wish I took a better photo of this blue flower. 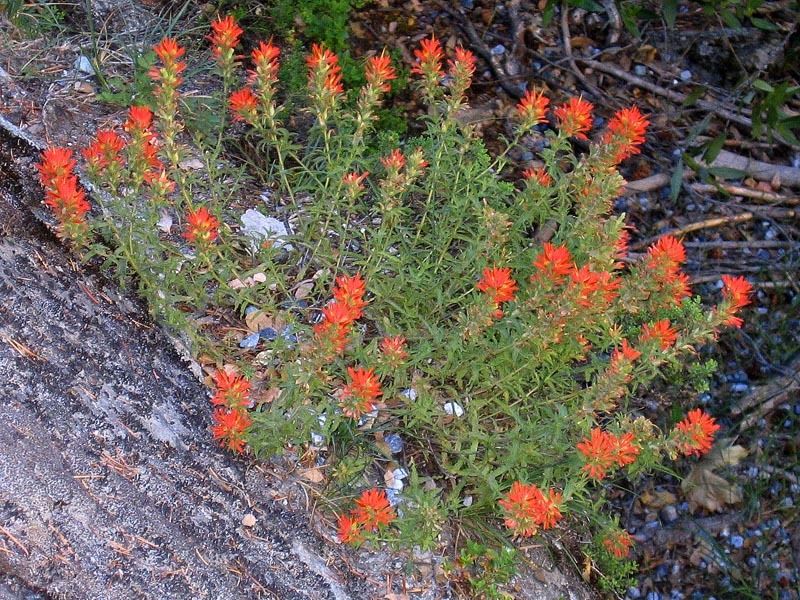 A rest on the trail allows time for a look around for wildflowers that tend to be small and low to the ground. I am having a great time. 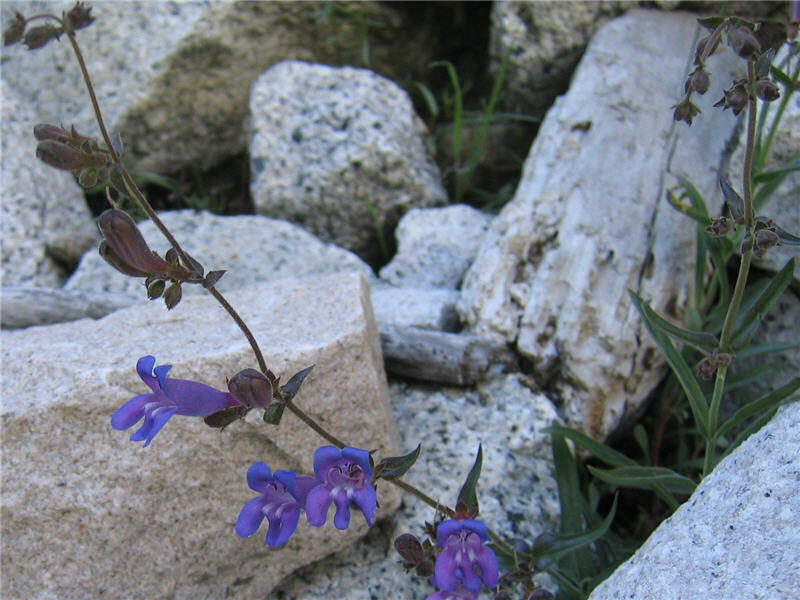 Here are some Penstemon heterophyllus, also known as Foothill Penstemon. Penstemon genus is the largest genus of flowering plants endemic to North America and most of its 250 species occur in the western United States. Here is another, close up photo of the bloom. Nice colors. 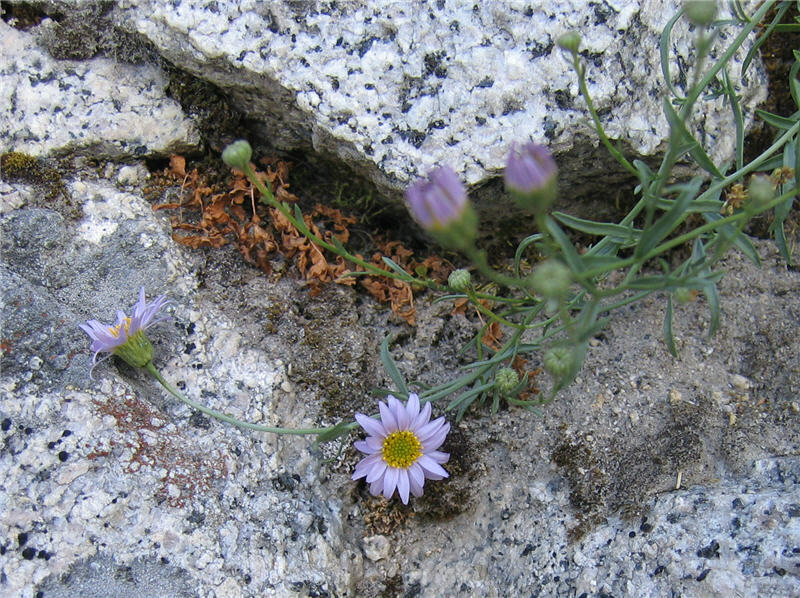 This is an Aster alpigenus, Alpine Aster. Looks like a small purple daisy. 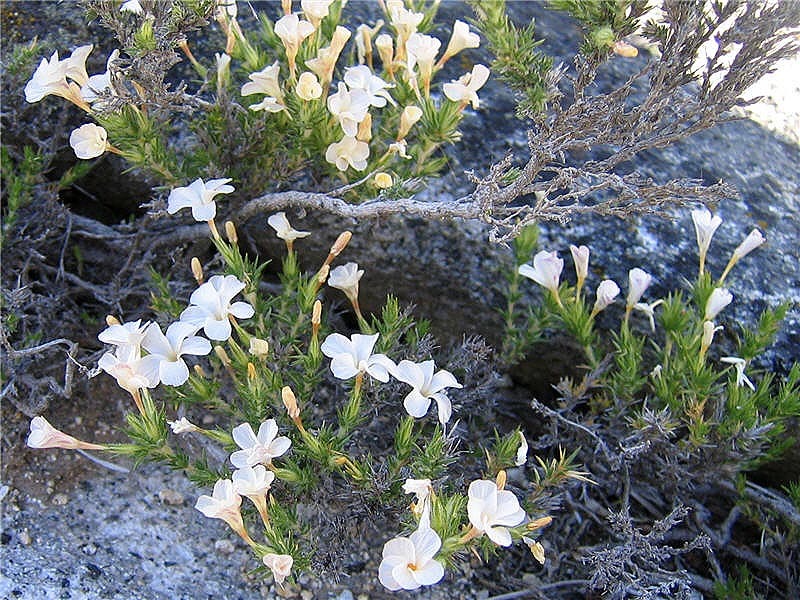 The genus comes from Greek for star and the species name comes from Latin for alpine. 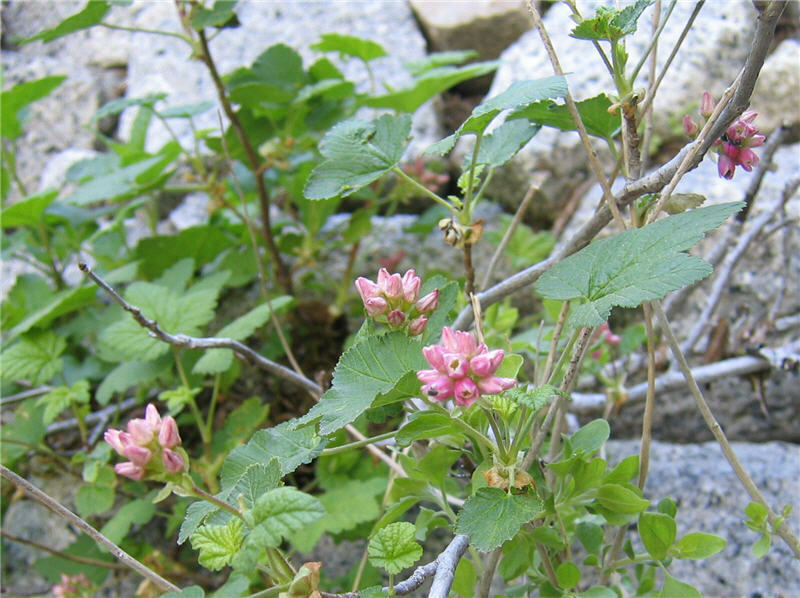 This is a photo of Ribes nevadense, Mountain Pink Currant. 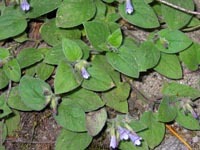 A shrub that produces blue black berries and is related to the gooseberry family. 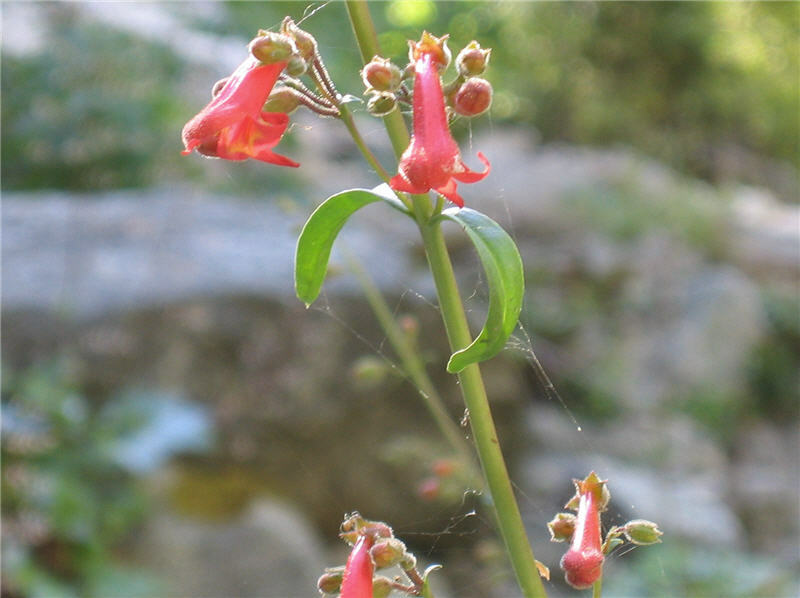 This is Penstemon rostriflorus, also known as Scarlet or Beaked Penstemon. Commonly know as Lady fern this is Athyrium fillix-femina var. cyclosorum. 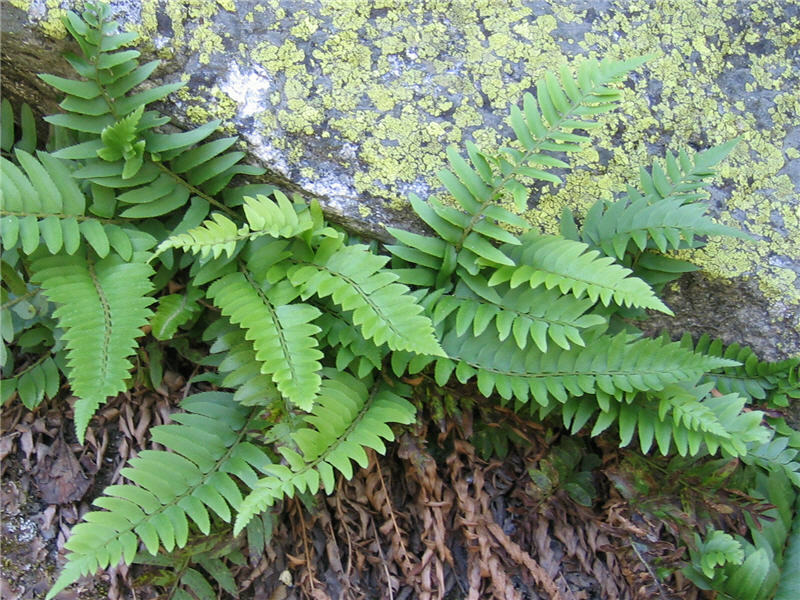 Fern is good enough for me. 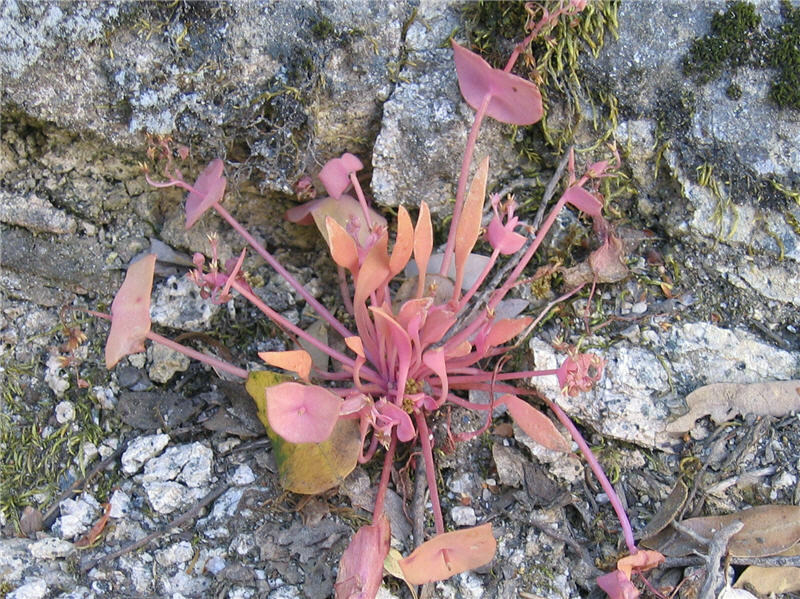 This is called Claytonia perfoliata, Miner's Lettuce. It has very small blooms that are past their prime here. And the unusual thing about this one is the leaves have started to turn color, green is the normal color, probably because of the warming and increasingly dry conditions. Like fall colors, maybe? It is edible, I will try it next time. Mr squirrel loiters for crumbs or a handout. This is being shaded by Taylor and is Phlox diffusa, or Spreading Phlox. The genus is Greek for a flame and the species name is Latin for spreading. 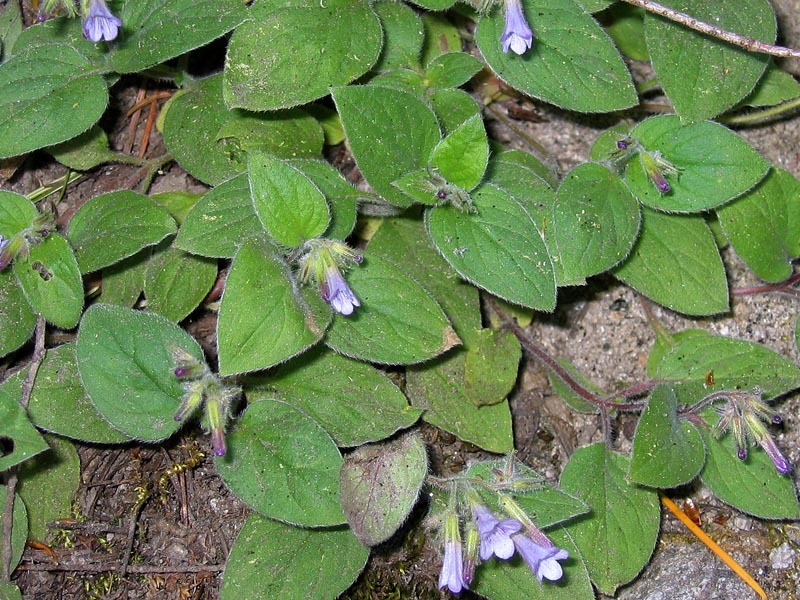 The bloom color is brilliant and the grwoth habit is low, spreading. 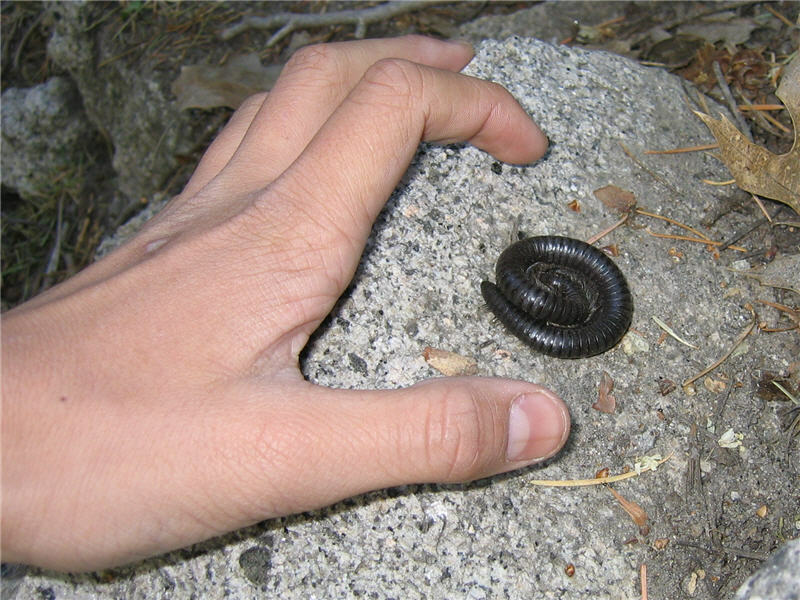 The large centipedes are very common on the trail. I am not sure why they are so abundant and die out in the open like this. 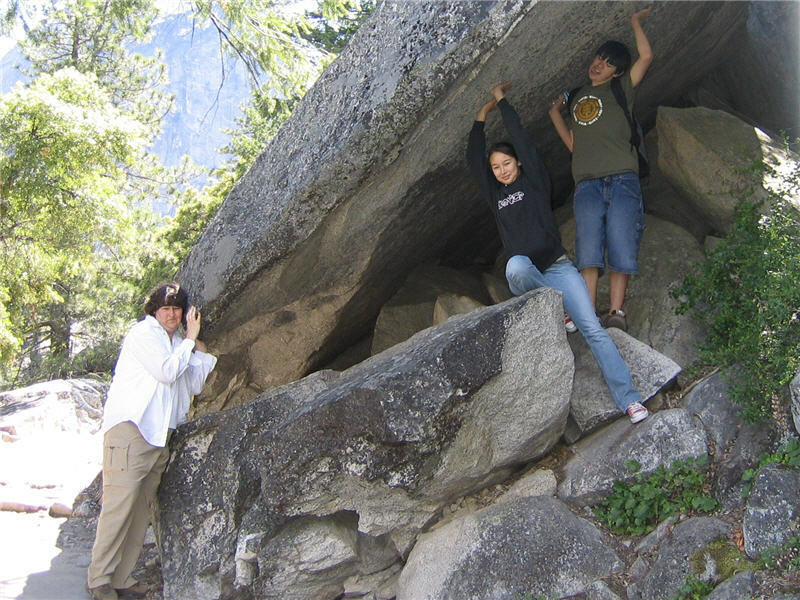 Hold that rock while I get your photo! 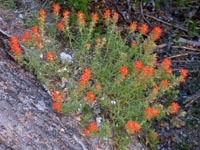 Very common wildflower, Castelleja miniata, Red Paintbrush or Indian Paintbrush. Latin for cinnabar red. This is where we had lunch. Pb&j yum. This is a trail junction where the JMT meets with a spur that comes up from the Mist Trail between Vernal and Nevada Falls. 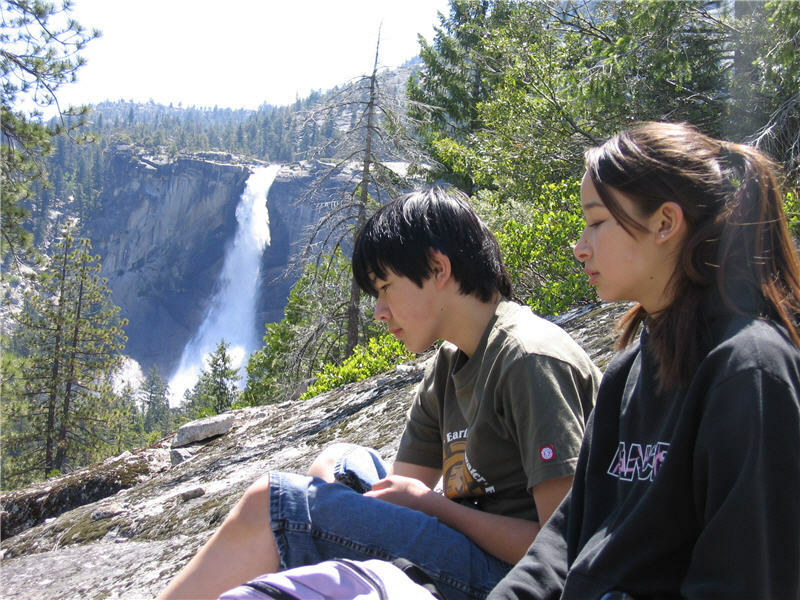 About one mile from the top of Nevada Falls. 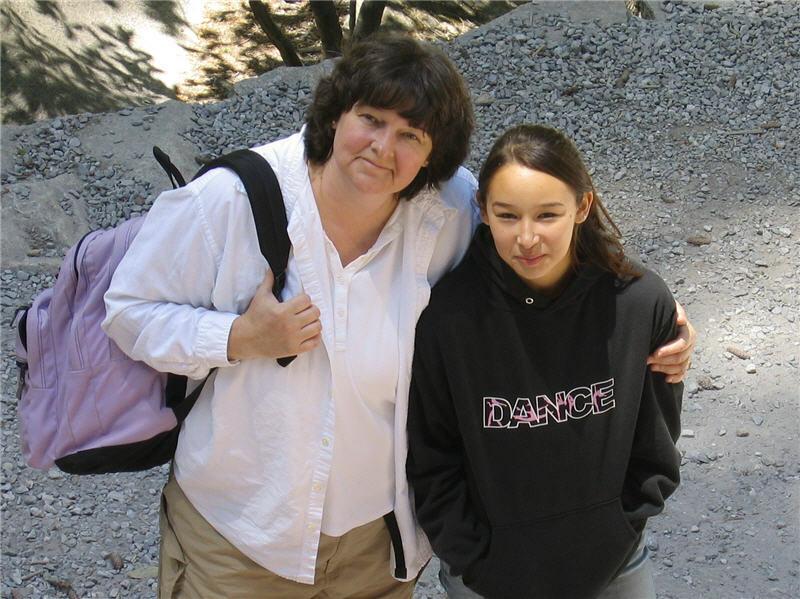 I stand atop a large rock to look down at mother and daughter at the Vernal Falls bridge. Lots of people here. I must come back to this spot to try to get a better photo. There are lots of people on the trail as well as on the prime photography spot. 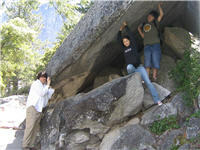 A large flat rock just outside of my photo here. Next time I will try an early morning shot. This nice plant and flower photograph is sharpened and slightly color enhanced. But it is still a beautiful wildflower. It is Draperia systyla, commonly known as Draperia. 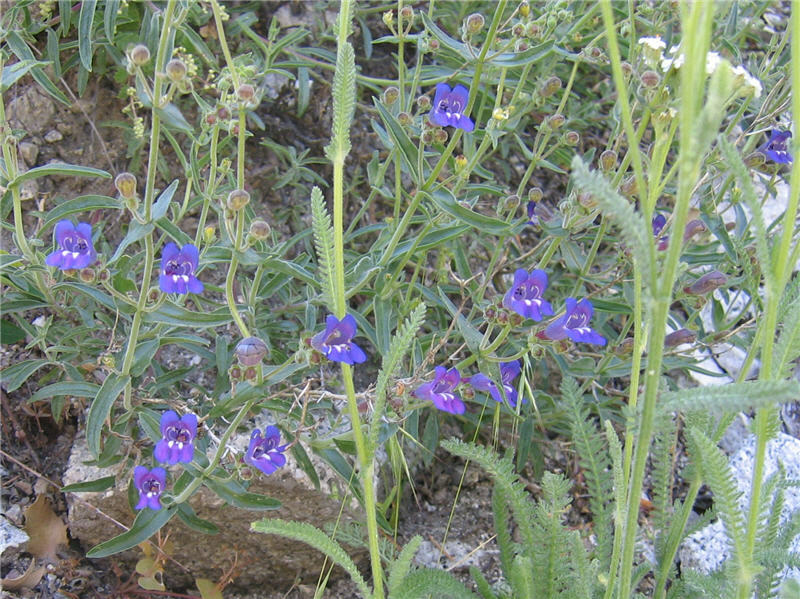 The genus name honors 19th century American historian and scientist John W. Draper. 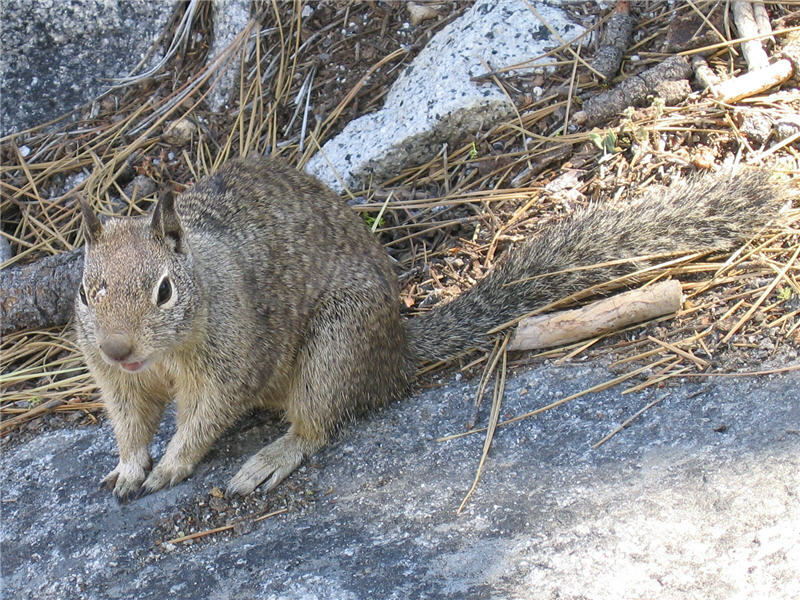 This genus only occurs in California and contains only one species. 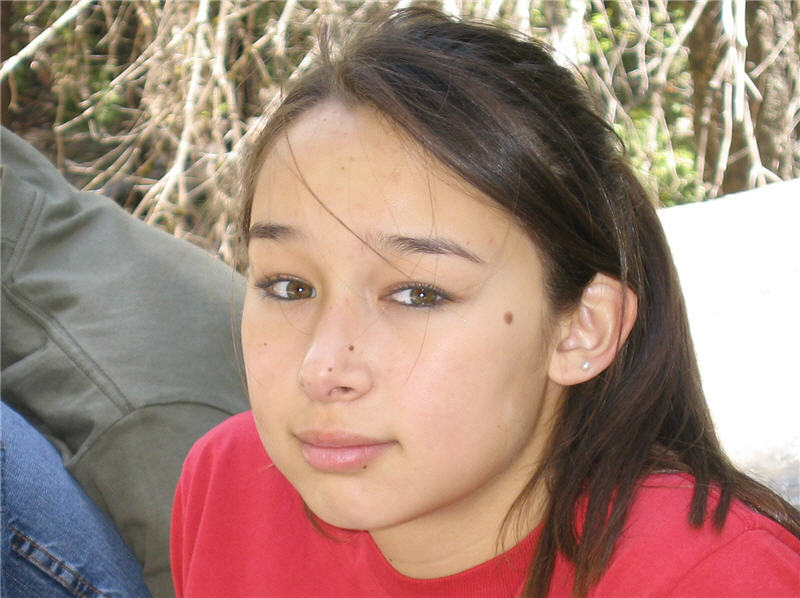 No wonder it took me awhile to identify this one. Stuart and Taylor enjoy the view and the break. I hear good things from them about the view. We encounter the crowds on the way back down to Happy Isles and are stalked in the parking lot. There are no spaces left, but there are many cars circulating fruitlessly. The crowds and traffic are amazing. 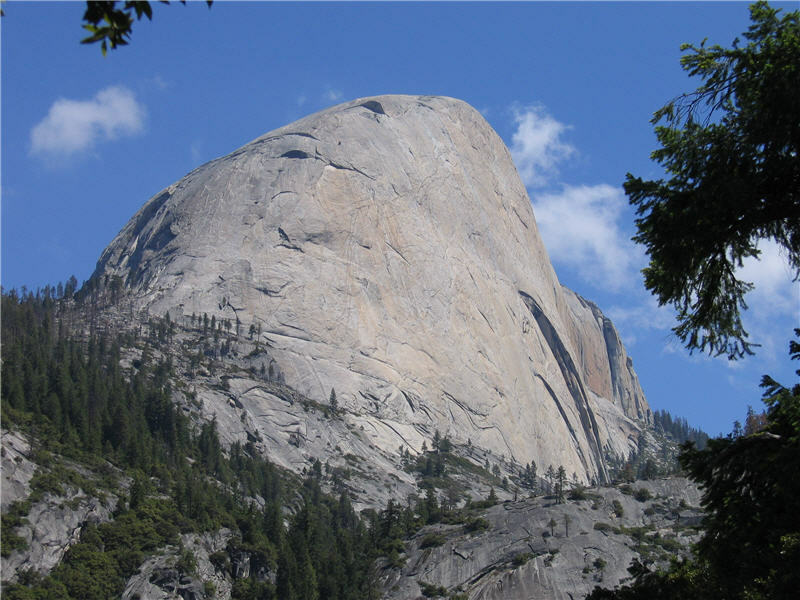 On the way out of the valley we encounter a minor traffic accident and further on see a rescue helicopter in the meadow below El Capitan. They sleep soundly as I drive carefully home. I am consious of the precious passengers next to me. We stop for dinner on the way home and end a wonderful day by sleeping in our own beds. Life is good.